It appears all one has to do to in the convoluted world of Republican Murica, is create a myth about something you dont agree with because it goes against your fantasy view of reality, get some creep to secretly film and edit, the asking of loaded questions and VOILA you now have reason to destroy the conjured evil. Well good for Arkansas! 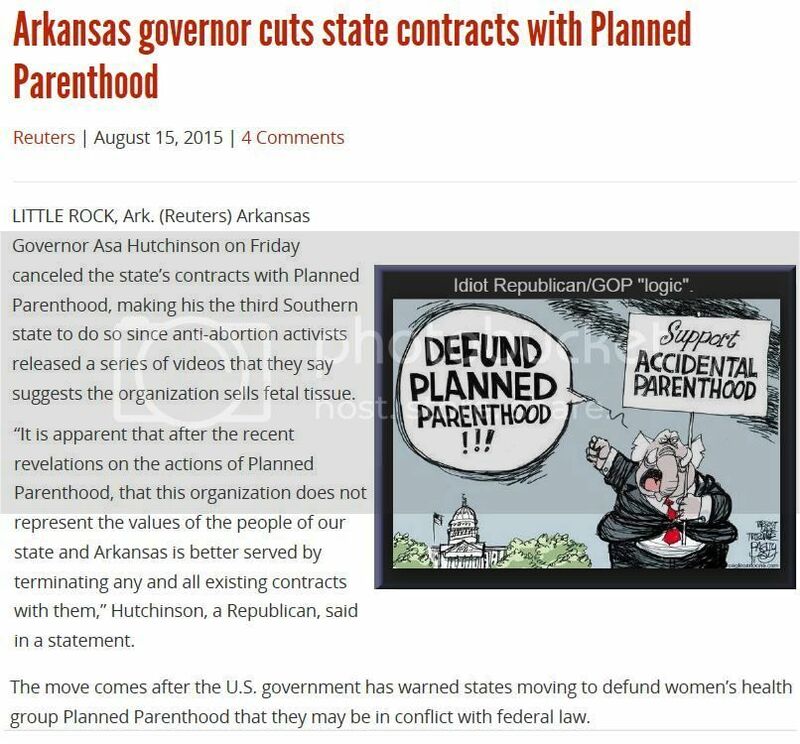 Since our federal wimp-resentatives were afraid to do anything, it is solid governors like Hutchinson who must clean up the mess. My only hope is that he takes the money that was previously given to PP, and reallocates it to more noble womens clinics. What is a more noble womens clinic, one that limits womens rights to what you want them to be? Abortion is legal. Donating fetal tissue is legal. Blunt discussions between medical professionals are legal. What exactly is your problem? Medical professionals are called on to do seemingly brutal and horrific things every day, and patients would find many of their private discussions cold, cavalier and vomit-worthy. Does that make them amoral people? Does that make what they do immoral? People need to grow up. We should be THANKFUL for these medical professionals. The amoral people are those who secretly record such conversations, manipulate them, and use them to inflame and push a fringe social agenda.